Every advertising campaign aims to persuade and convince a customer and get conversion or lead for the product or services being promoted by them. A properly planned and executed advertising campaign brings good result in terms ROI (Return on Investment). An advertising campaign shall start from survey and research of target audience designed around the niche market of the advertised product or service. After identifying the niche market, the next step should be identifying and presenting your product amidst your prospective customers. 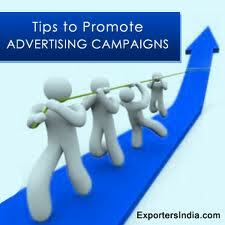 You can gain an advantage in an advertising campaign by telling your customer about the benefits of your products. After the initial brief to the customers about the benefits of a product the real branding should start from here. This requires handsome amount of money to carry out a campaign successfully. For the purpose budget should be allocated to the campaign. After allocation of budget various mediums and platforms should be identified to carry out the campaign. Identify the media, which has better reach in the market and could convey the message to the target audience in the most effective and emphatic manner. It is not necessary that your product may appeal to every person that comes across it. The advertising campaign can also be for a specific class or section of people. Before launching the ads in a big way they must be checked among small group of people for a feed back.